Are you thinking about taking the plunge in to having a pool of your own in the backyard? Neighborhood pools can be nice and even sometimes extravagant with water slides and mushroom sprays but wouldn’t you rather enjoy your pool time with friends and family, not the whole neighborhood? Let the Hutcheson Hoticultural Pool Professionals create the backyard oasis you have always wanted. Custom pools in Woodstock and throughout the Atlanta area that include beautiful landscaping and hardscapes is our specialty. Today’s pools aren’t like your grandparent’s swimming pools, a rectangular or kidney shaped hole in the ground filled with water and surrounded by three feet of concrete decking. 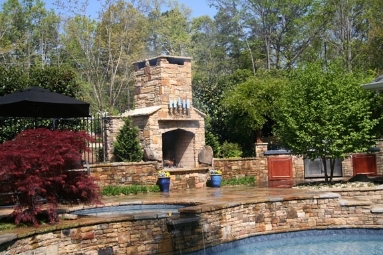 At Hutcheson Horticultural we work to make your swimming pool the center or focal point of your outdoor lifestyle. When many people think about pools, their mind goes to large expansive water areas surrounded by lots of stone decking or pavers. Yes, that is one option, but if that doesn’t fit the way you live, don’t let preconceived ideas hold you back from adding a recreational water feature or area to your backyard. Plunge pools, lap pools, and infiniti pools are all among the choices you can make to truly individualize your backyard to your design aesthetic. Or mAs one of the leading designers of pools in the Atlanta area, we keep up with all the trends in pool design. The greatest benefit of working with Hutcheson Horticultural to build your new pool is that you are not just working with someone that will build your pool, we will design and plan all of the surrounding landscape to be integrated and enhance your swimming pool. Hardscapes, planting beds, landscaping, lighting, and outdoor fireplaces are among the elements that we bring in to one complete package. In other words, we are a “one stop shop”. If you need ideas to help figure out what you might want in a pool, check out popular sites like houzz.com, hgtvgarden.com and pinterest.com. All of these sites offer great visuals to help you find the concept on which we can help you design your dream pool. After that, contact Hutcheson Horticultural at 770-924-1001 or through our website so that we can meet with you to plan and build the ideal swimming pool for you.